The faunal assemblage from the Riverside project area was composed of 951 fragments of calcined or burned bone and one fragment of shell. 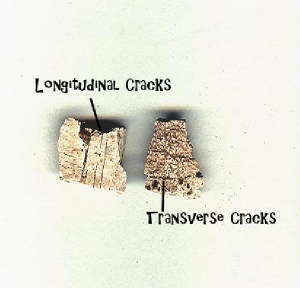 Cracks on the calcined bone indicate that the majority of it was burned when in the green state, with the result being transverse cracks and checking across the surface. 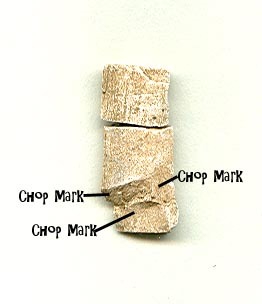 Only one fragment bore cracks indicating that the bone may have been dry when burned. The vast majority of the remains could not be identified beyond the level of medium mammal. Those that could be identified further were found to include predominantly deer, with beaver, and painted turtle also being present. Deer and turtle were found in most of the assemblages, but beaver was only identified at Riverside 4 and 5. This may indicate that these two assemblages, which were spatially close together and may both date to the Late Woodland Period, were occupied during the same seasons with people conducting similar activities. The extremely fractured nature of the assemblage may be the result of a combination of cultural and taphonomic forces. The bones were likely butchered for consumption and may have also been smashed to remove the marrow and possibly to process them for the removal of grease. If food shortages were affecting the people at the site, the bones may have been smashed to provide food as well as grease. The calcination process, trampling and excavation also further reduced the size of the fragments. The elements of the deer carcass present in the assemblages was fairly consistent between areas at the Riverside project. The majority of elements present came from the limbs, with few cranial or thorax fragments being recovered. This may indicate that predominantly limbs were returned to the site, a common occurrence with hunters hunting far from a base camp. The fall deer hunt was an important occurrence to Native people, and the numerous deer and medium mammal (likely deer) fragments from the areas may be the result of men returning from a fall deer hunt with the bones being processed and subsequently thrown in the fire to dispose of the small fragments. Barber identified a complex at the Rivers site in Vermont that consisted of a deep pit, a limestone roasting platform, a stone tool assemblage identified as a possible butchering kit and a faunal assemblage consisting only of deer neck, torso and upperleg bones (Barber 1982). The entire complex was explained as representing a fall communal deer hunt processing area. The assemblage from the Riverside site, showing a predominance of deer elements, elements that contained high meat and marrow values, may represent something similar. This hypothesis may explain the assemblage from the Den Rock site as well. This is a hypothesis that needs further investigation. The assemblages from the Riverside project is consistent with those recovered from other eastern Massachusetts sites such as the Den Rock and Tura sites. Deer made up the bulk of the meat eaten with bird making up a much smaller portion at all the sites compared for this project. Den Rock and Riverside 4 and the Tura site, had assemblages that were similar in composition, with a higher percentage of deer cranial fragments at Riverside 4 and Den Rock, and overall, more of the deer carcass being present in all three. Riverside 5, on the other hand, was composed mostly of lower front and hind limb fragments with a lack of most other elements. Overall, the assemblage from the Riverside project shows a predominance for medium mammal, likely deer, having been thrown into fires at all of the areas. If all of the bones from all of the species consumed by the inhabitants had an equal chance of being deposited into the fire, then we would have to conclude that deer formed the core of the meat portion of the Natives diet. Unfortunately, we can not be sure that all animals or even all parts of all animals consumed, were treated the same way.